A room without curtains can so often look naked, like something is missing. Sure, bright windows add a raw beauty to a room, but imagine that same room with curtains to add color and texture, and things just seem more complete. Dare I say, better. When I’m redecorating a new space, I often browse for window treatments as the first to-do on my list, because—even more than rugs and bedspreads—I struggle to find suitable curtains. There’s just so much to consider, and the price points are vast, to say the least. Still, there are so many places you might not think to shop for windows treatments. Join me in a shopping extravaganza as I scour high and low for the best—and most unexpected—places to find curtains, suitable for all different price points. Decor wise and budget wise, you’ll see that there ‘s something for everyone! Oh, white. Years ago, I hated you. I thought you were so plain and boring. But now, you may just be my absolute favorite. Your clean effervescence and stark contrast to color make you a front-runner in almost every room these days. Even on the dreariest winter afternoons, a panel of gauzy white lets every little bit of daylight in while still structuring a room. Kohl Home Classic Voile Curtains ($9-$12/panel) – Basic and beautiful, these curtains offer a sophisticated gathered top with a flowing base. Urban Outfitters Chloe Gauze Curtains ($29-$49/panel) – The subtle checkered print gives these curtains an extra dose of life while still enhancing the simple brevity of a white framework. West Elm Sheer Chevron Curtains ($79-$99/panel) – Some might say chevron is on its way out, but this curtain’s breezy design leads me to believe that it’s definitely still in when incorporated into a room in a low-key way. When it comes to window treatments, a carefully chosen pattern can act as an artistic focal point in the room. Sometimes you want your curtains to blend in, but other times, an abstract pattern offers just the boost of flair a room needs to really shine. Overstock Henna Blackout Curtains ($35/panel) – Sometimes the bigger the pattern, the more pleasing to the eye—especially when you can introduce a unique shape and color to a room. These curtains offer a warm tone without overshadowing other elements in the room. Crate & Barrel Molly White and Grey Curtains ($60-$80/panel) – Medallions can be overpowering sometimes, but this refined color combination and the tiny flourish on each medallion scales this pattern down to a sophisticated winner in my book! Anthropologie Petalwood Curtains ($78-$108/panel) – With a dose of woven-in metallic, these curtains absolutely shine. What a statement piece for a room! Perhaps my favorite, floral curtains offer the freshness of a pretty bouquet that never dies. You’ll find a bundle of choices ranging from large, bold flowers to soft, tiny blossom prints that work in a variety of rooms, from the baby nursery to your kitchen windows. Target Maya Floral Watercolor Curtains ($30/panel) – Leave it to Target to boast a fun and fresh spin on florals. I adore this one large blossom look. Walmart Floral Paisley Curtains ($50/panel) – When florals and paisley meet, the result is fun and feminine. 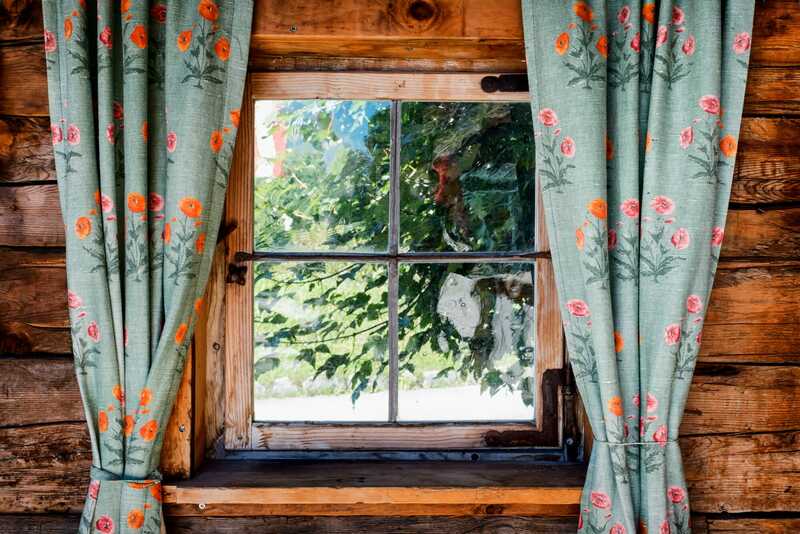 These quaint curtains will nestle any window beautifully while infusing your home with a vibrant dose of spring and summer. Bella’s Home Decor Bohemian Floral Curtains ($170/pair) – Sometimes custom is the only way to go. Best of all, you can request matching pillow covers. Some might consider solid colored curtains to be “safe”, but I think they merely provide a different avenue of decor thanks to the vast array of available textures. Once you narrow down a color, the world of texture explodes from linen to velvet and everything in between! Bed Bath & Beyond Kenneth Cole Reaction Curtains ($35/panel) – This cotton linen blend will add a rich and classic air to any room. Blinds.com Ultimate Blackout Grommet Curtains ($46+/panel) – I can’t say enough good things about blackout curtains, especially for bedrooms. Having the ability to control the light that comes in is such a lifesaver, especially on those mornings when you need extra sleep. Plus, Blinds.com is fully customizable, so you choose the width and length on every panel. Pottery Barn Dupioni Silk Drapes ($75-$339/panel) – Talk about a statement piece. These richly textured silk curtains come in a variety of elegant colors that are sure to become the focal point of any room! Kids are only kids once, so don’t let function and proper curtain etiquette put you in a box. Feel free to go wild and choose something your kids will love and remember for years to come! Land of Nod Silver Star Curtains ($19-$39/panel) – Want your little one to have sweet dreams? These curtains are perfect! Amazon Outdoor Adventure Curtains ($55/pair) – Nature themed rooms are all the rage with little ones right now, and these curtains complement exploring hearts perfectly. Minted Sea Life Curtains ($63-$138/panel) – I can’t think of a little one who wouldn’t love narwals cradling their window, can you?